This is a fun way to start growing and taking care of your seedlings. 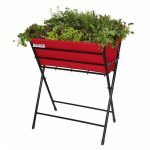 It is perfect if you are new to gardening or it serves as a great place if you are a seasoned gardener who just need that extra little area to give your next generation of plants a good start to their life. 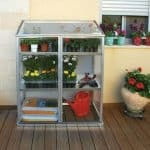 It is small and neat in its design, meaning that it will fit in any garden or even a greenhouse. 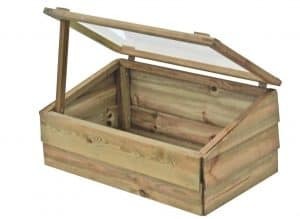 It is constructed out of wood with a shatterproof acrylic lid and will allow your young plants good circulation and protection from the harsh elements. The box has been pressure treated so it will last for many years and you will be pleased with this product which is easy on the pocket. This is not available to buy online. Even though this is under £50 it is still made very well. The whole box is made with timber that is not only of a high quality, but it has also been planed smooth as well. The overlap design gives is a classic charm that many gardening products do not have these days. As well as being made with impressive timber and shatterproof acrylic the lid is solid and will stay in its place due to the two robust hinges that have been used. The Grange Wooden Cold Frame is the ideal place you will be able put your seedlings when you do not fancy their chances in pots that are out in the garden or even in the larger greenhouse if you have one. This is a fantastic, low cost way to take your gardening to the next level. 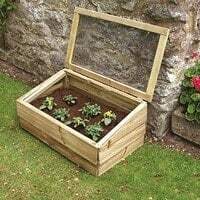 This is an ideal size for those of you who just want a little bit of space to look after a particular set of seedlings which are going to turn into some very pretty plants or even as a place to put some food and make sure it is safe during its early days of growth. The width of the box is 2 feet 7 inches, and the depth is 1 foot 6 inches. 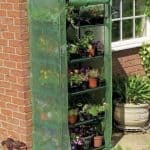 This may not sound like a lot of space, but you will be able to fit more than a few plants inside of here, plus it takes up very little space in your garden. It is not very high at 1 foot 2 inches so you will have to get down on your knees to look after the seedlings, but let’s face it being in the mud and getting your hands dirty just makes it even more rewarding when they start to grow. The roof, actually lid is the proper term for what we have here, but the lid is just fantastic and will cover the whole box well enough so that no rain gets inside, but light will be able to beam in to help the plants grow. We really like this lid and are impressed with the high quality of this lid and we can assure you what you place in the box will be safe from rain, the kids and any creepy little animals that may be looking for a free meal. They have used overlap cladding for the sides of this box and we really love the classic somewhat rustic look that it gives it. This is impressively thick and it will keep the rain out and also be able to take a little bit of abuse thanks to it being quite thick timber they have used. Despite the old look that the box has, the timber has been planed so it is very smooth. The box has a very thick frame inside of it that will make sure this is one very robust box. This is small enough that you may want to pick it up and move it to different parts of your garden over the years. Well this frame if you do decide to do that will ensure the box stays solid and will prevent it from becoming flimsy over time. The sheer fact that they went to the trouble of putting a solid frame in here really did impress us greatly. The bottom of this box is very solid and will be able to take the weight of a lot of mud, compost or whatever secret ingredients you have which will help make your plants grow. Honestly there really are not a lot of things we can say about the floor, just know that it does what it does very well. The planed timber used in the construction of the Grange Wooden Cold Frame has all been pressure treated which will certainly make it last for a long time. However a coating of wood treatment is something that we would highly recommend you do in order to protect it from rot and decay. If you were to keep this in a greenhouse though, then actually you would not need to treat the wood at all as it will not be out in the rain. This comes with a one year manufactures guarantee that will cover you against rot and decay. We did kind of touch on the door before as the door, lid and the roof is all the same thing. This lid is kept in its place with a very high quality set of hinges that will make opening and closing it nice and easy. One thing we really liked was how there is a little bit of wood which can be used to prop the lid open. This is a cool little touch and will be great for those of you who do not have this next to a wall which could support the lid. 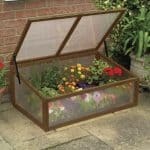 So that your seedlings or whatever else you may use this box for can get plenty of light the lid is mainly made up of a very strong and high quality shatterproof acrylic panel. Your seedlings will get all the sun they need here while at the same time being protected from the rain and anything that might fancy them as a little snack. There is no way to lock this box up, but with the lid down it is a very secure place to keep your seedlings. We do not think adding a lock or any other security measure is necessary. 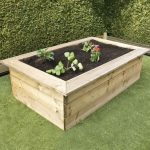 While the lid is very easy to look into, due to the small size of this box it could blend into your garden and possibly go unnoticed by most people. Also if you do have this in your greenhouse then again it is something that would sort of just blend in and go unnoticeable. We really do love the rustic look of this and think that a huge part of the charm is the design. But you could always give this a more colourful coating of paint if you did want to make it a stand out a little bit more or perhaps even make it a little bit more modern. This is a low priced box and it is also not something that is hustling you to spend more money on extras that you ultimately do not really need. You just buy the box and that is all you have to worry about. Considering the low price this is actually very high quality and it has impressed us a great deal. If you have this outside then you will need to give it a coating of treatment, if it is in a greenhouse then this is not needed. No matter where you keep It with the right amount of care, you will be able to have fun with this for many years. Now we are not going to slate this for being small as that is part of its charm, but at the same time we do feel some people will expect a little more. Just be sure to know before you pick this up that it is a small box. The hardest part of the installation is dealing with the store clerk as this is only available instore. Once bought, you just bring it home and in no time at all you will be ready to put your seedlings inside it. At under £50 there is no denying that this is offering amazing value for money. Final Thoughts: No matter if you are someone who is new to gardening, looking to just get started or someone who knows what they are doing and just wants an extra place where your seedlings will be safe, the Grange Wooden Cold Frame will be perfect for you. This is a great little extra that will work wonders for you and make sure your seedlings are going to be starting their life off in the right way, which will hopefully result in some truly amazing looking plants. We really like what they have done here and feel that this is something that is very easy to recommend, especially considering the very low price. I bought this for me and my daughter. I wanted to break her into gardening and teach her how to take care of seedlings. I thought this was the best way to do it. I like the shatter proof glass and the light weight. I also like the price and since I’ve tried it, I am going to get another one or two and have fun teaching her how to transplant seedlings to ground. 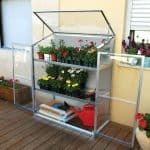 This is a very convenient piece to put in a green house and organize seedlings. I was wrestling with tiny pots that would spill over and hit the ground and get unplugged with any wind. This holds quite a few and is great in numbers. I have them labeled with different seedlings at different stages it’s spot on! Couldn’t be more into this little piece of equipment. Much like the other purchasers, i also bought multiples to organize part of my garden for transplantation. It does hold more than what it may look and for the price, an avid gardener would do well to have a few. This is the best value for money I’ve seen for the same kind of box. This was great for my herb seedlings and sprouts. I have a large garden full of all the herbs and spices I use in cooking. I am an avid cook and my garden is well kept and smells delicious. I love taking people through my herb garden and exposing them to all the new and some exotic herbs and spices for their enjoyment. These boxes are constructed well and can be moved with ease. The shatterproof design is a plus. The price made it easy to have multiples. I did not get what I was looking for. I like the fact that it is cute and small but it is too small for me. I expected for space from it. Then comes the durability factor. Although it is made of shatterproof glass, my one got severe scratches as it fell to the rough pathway from my hand while I was taking it from side of the garden to another. I had to search for it quite a bit in the market as it is not available online. If only the build quality was better and the size a bit bigger, I would have advised others to go for it.